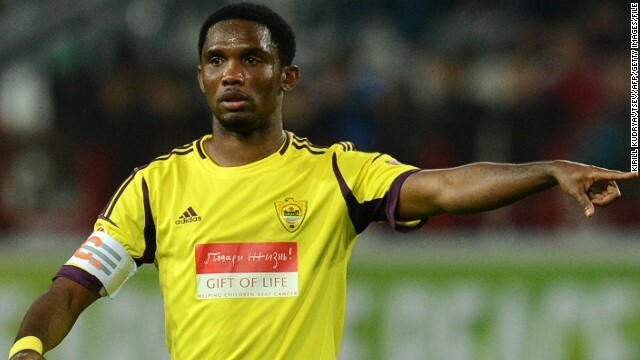 Cameroon striker Samuel Eto'o will be reunited with former manager Jose Mourinho at Chelsea. (CNN) -- Together they shared an all-conquering season at Inter Milan, now Jose Mourinho and Samuel Eto'o are to be reunited in London. The Cameroon striker will get his first taste of the English Premier League at the age of 32 after joining Chelsea from Anzhi Makhachkala. Eto'o reportedly became the highest paid player in the world when he moved to the Russian club in 2011 but is the latest high-profile departure in the club's fire sale. Anzhi announced their intention to cut costs earlier this month, with Willian joining Chelsea on Wednesday for a deal reported to be worth $46.5 million. Now Eto'o has followed the Brazilian to London in a move which means Wayne Rooney's much-touted switch to Stamford Bridge from English champions Manchester United looks increasingly unlikely. During their time at Inter, Mourinho and Eto'o won Serie A, the Italian Cup, and the European Champions League. Eto'o arrives at Chelsea as a four-time African Player of the Year. "I am very happy to be here but also anxious because I want to get playing as soon as possible," he told Chelsea's official website. "It wasn't a hard decision. I saw the qualities Chelsea have, and I was very happy with Jose Mourinho before, so when the opportunity came, I was very happy to take it." Eto'o's career took off when he joined Spanish giants Barcelona in 2004, as he won three league titles and lifted the Champions League twice. He found the net 152 times in 232 appearances for the Catalan club before he left to join Inter in 2009. His move to Anzhi came as a surprise when it was announced in 2011, with reports claiming he was on a salary of $464,000 a week. At the start of this month, the club said they would be aiming to save between $50-70 million dollars a year and sacked coach Rene Meulensteen after just two games in charge. Eto'o is the latest in a line of high profile signings Chelsea have made since Mourinho returned to the club. German international Andre Schurrle, Australian goalkeeper Mark Schwarzer, Croatia striker Stipe Perica and Dutch midfielder Marco van Ginkel have all arrived, leaving Mourinho with a wealth of options.